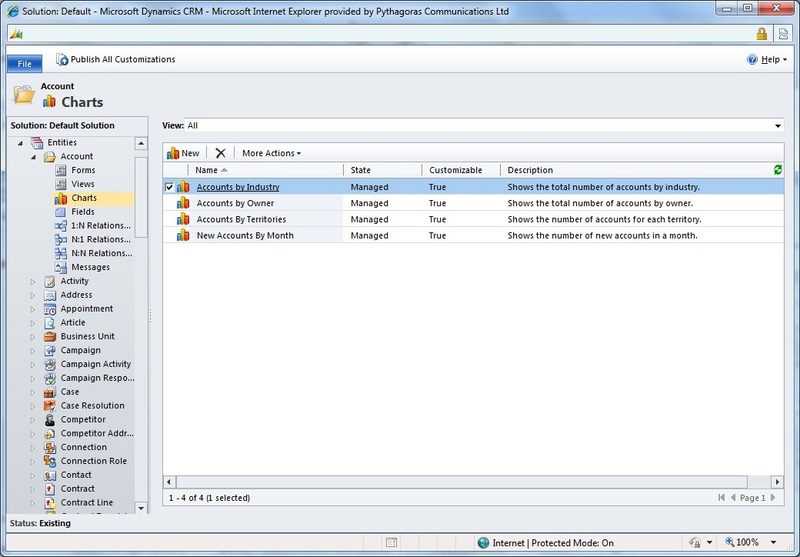 Dynamics CRM 3 and 4 could often feel like a Database-driven system given that Users were restricted to looking at data within a single entity at a time – a user would be looking at the list of their Opportunities or their list of Accounts, with only reports allowing them to see the picture of their work outside of the more narrow database definition of an Account or an Opportunity. This lead to the concept of Dashboards becoming a key requirement for many MSCRM projects as user’s liked the ability to see a view of their work, useful activities and other records in a single place. However incorporating Dashboards into Dynamics CRM often involved SharePoint, detailed use of SQL Reporting Services or other BI Tools – this put the use of Dashboards outside of many clients and projects. These Dashboards give an option to combine different entities data together to build a entry-point into the solution that is tailored for the user – essentially taking the single-entity views of data provided by the MSCRM Advanced Find Views a big step forward. Here we can access all the usual CRM Customisation options that we are familiar with from CRM 4, and also the new customisation options added for CRM 2011. One of these new options is Dashboards which we can expand to view the list of existing Dashboards and potentially create new Dashboards. From here, we can click the ‘New’ button to add a new Dashboard in 2011 as we have been able to add new fields or entities in the past – this brings up a simple selection screen for choosing the layout of the intended new Dashboard. This selection is similar to SharePoint in terms of selecting a page layout containing areas (Web Part Areas in SharePoint lingo) that can be used to drop Dashboard Charts or Lists into. From here we can click to add content into any of the Chart Areas – typically this would be in the form of a Chart or List of CRM Data presented through the Dashboard, however CRM 2011 also gives options for incorporating iFrames or uploaded Web Resources. Chart Charts allows the insertion of a graphical representation of a particular set of data within CRM. The data being defined as a particular view for a certain entity, to be presented via a graphical chart – such that the records returned by the View of the Entity Type can be totalled or listed within a Pie, Vertical Bar, Horizontal Bar, Funnel or Line graph. List Lists allow the insertion of individual views of entities into the Dashboard, such that multiple different entities and/or views can be displayed to the user as a single view of the CRM Areas that relate to them. iFrame iFrames allow the insertion of external Websites or linked Web Applications into the CRM Dashboard – this can affect Web Mash-ups or additional Custom Screen Logic to form part of the User’s Dashboard. Web Resource Web Resources allow the insertion of static Web Content into the Dashboard, typically HTML or Silverlight sections. These differ from iFrames in that the Web Content is updated into the CRM Database as a Web Resource before being invoked in the Dashboard – such that the content is internal to CRM as opposed to being a Web Mash-up. 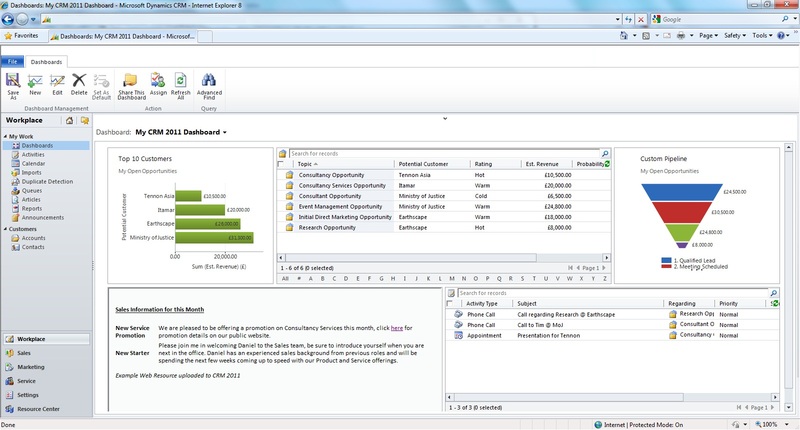 By combining these possible insertions (up to a possible 6 in total per Dashboard) we can build various Dashboards tailored to the appropriate audience, such as an example Sales Dashboard listing a particular Salesperson’s (through the use of the My Opportunities view filtering Opportunities to those assigned to the same person as viewing the Dashboard) list of Opportunities, list of Activities, Pipeline and key Customers. 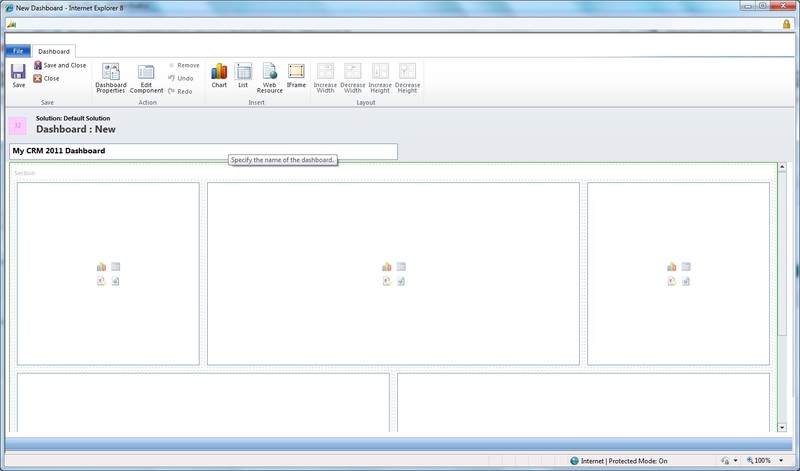 Building an Example Dashboarding in CRM 2011 using standard Lists, Charts and a HTML Web Resource. 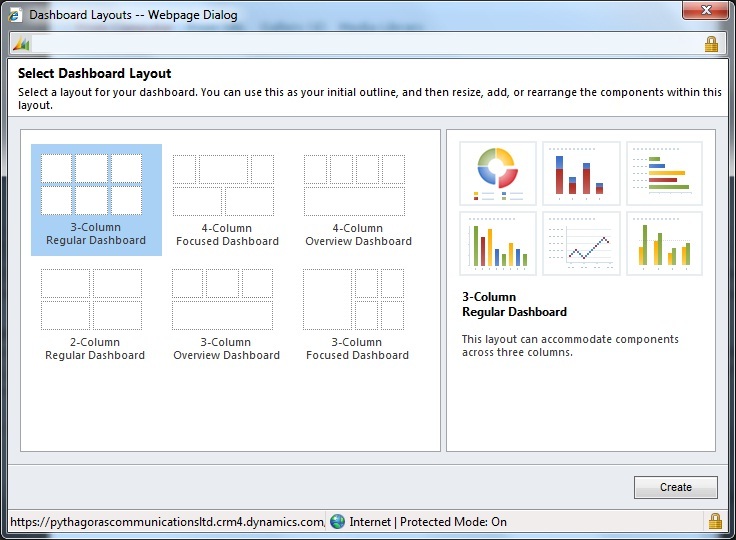 This Dashboard can also include a Web Resource containing a page of simple HTML uploaded into CRM 2011 as way of providing other information or announcements to the Dashboard audience. This Dashboard utilises the standard Charts and List available in CRM 2011 to build a simple sales-focused Dashboard – these Charts and Lists can be further extended by the creation of new Chart Types and new Views that can then be used in the Dashboard. 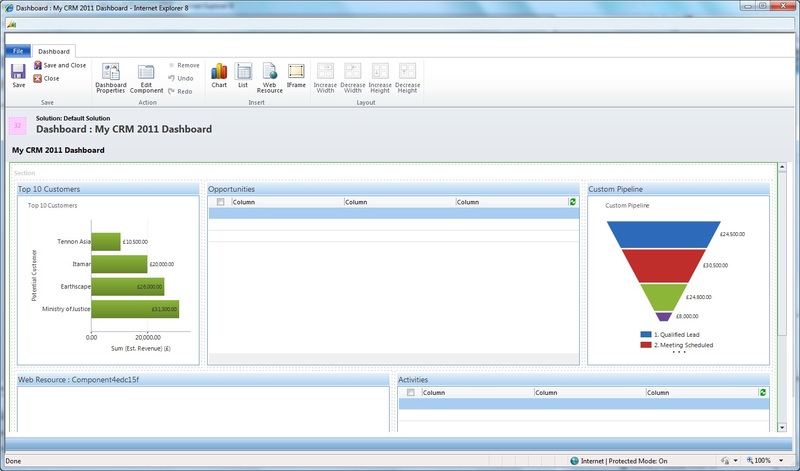 We can see this in the customisation area of CRM 2011 in the ability to add new Charts for each Entity. Here we can add Charts that look at a particular entity and are capable of producing a simple Chart Report based on Grouping and/or Sub-Dividing based on the fields within this entity. This (similar to the Advanced Find) does give us an initial set of restrictions in what is possible here in that we cannot instruct a chart about the Account Entity to sum the Opportunities related to each Account, or vice versa compare Opportunities by a field on the related Account for comparing Opportunities by Account Type or Industry Sector – however for more simpler within the same entity purposes, this gives us a simple interface for creating new Charts that can then be used in different Dashboards. These Charts can then be saved as new customisations to the entity – and added to various different Dashboards. Crucially here we can take the existing Dashboard we have created and use the new ‘Save As’ function to create a copy of the Dashboard for this, as opposed to being forced to either create a new Dashboard from scratch or edit the existing. This addition is done via standard MSCRM concepts in selecting Entity Type, View and then Chart to give a range of Dashboarding options. In these various restrictions this concept of Dashboarding is not as flexible as using SharePoint integrated with SQL Reporting Services, as well as the CRM 2011 Dashboards not being capable of Choice Filters and other User Interface components that SharePoint allows for. 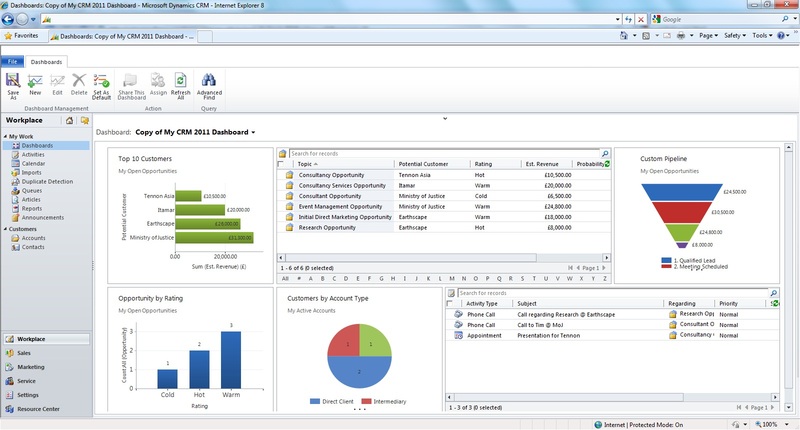 However despite developed SRS Reports being inherently more flexible over customised Charts – the sheer simplicity here gives a powerful tool capable of creating many types of Dashboard and Charts quickly and easily, meaning that every deployment of CRM 2011 should contain a layer of Audience-specific Dashboards and so not just those projects able to afford the additional software and consultancy to maintain full developed Dashboards through SharePoint or other BI tools such as Qlikview. 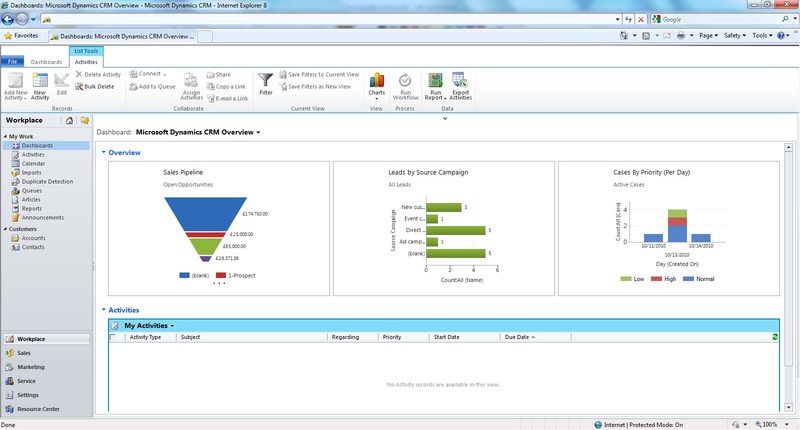 This undoubtedly increases the value proposition for deploying CRM 2011 into many businesses and is a fantastic new feature that combines the best of earlier versions of MSCRM (Advanced Find, Custom Views and the Reporting Wizard) into a powerful new area of customisation without code. 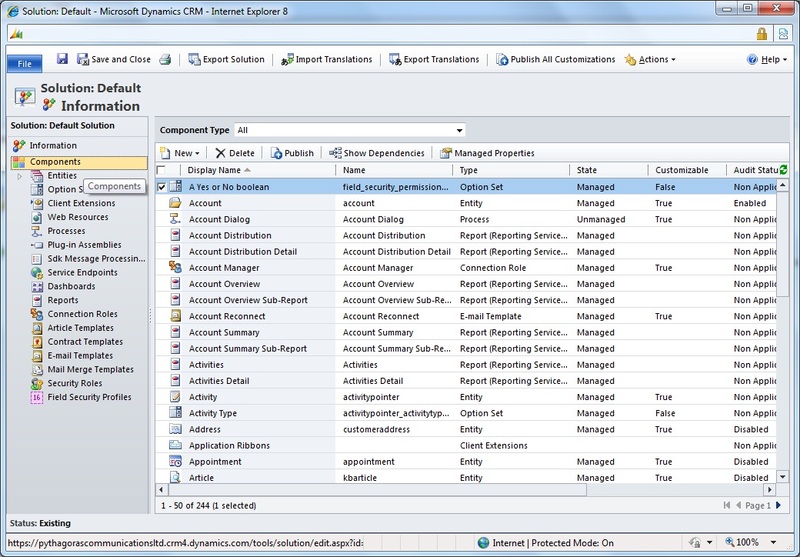 This entry was posted in CRM 2011, Customisation, MSCRM and tagged CRM2011, Dashboards, MSDYNCRM. Bookmark the permalink. This link describes how to export Charts as XML files which can then be modified to tweak their appearance, using the example of adding a 3D effect to the existing chart appearance. Hi, just wondering in “Marketing Dashboard” why there is no “New Campaign” ribbon button available when you select campaign area. any idea?? thanks..this article is very helpful to me. 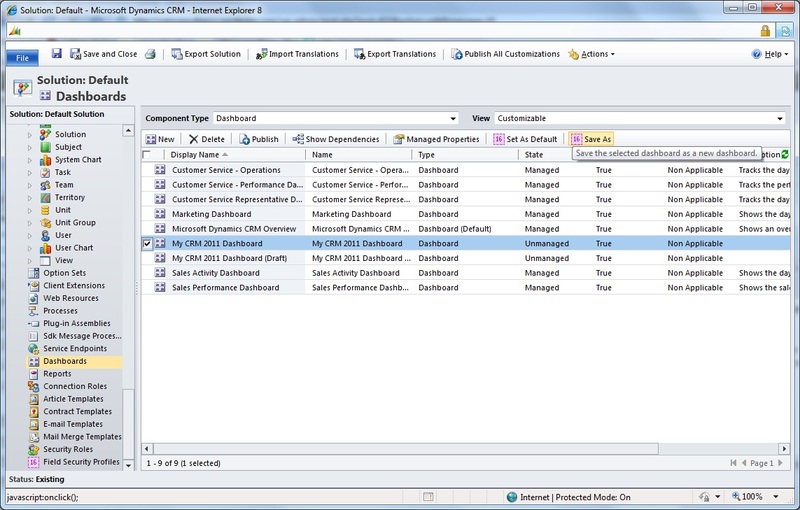 Is it possible in CRM 2011 dashboard to have a master-detail kind of interaction between two views or a view and a web resource withinn the dashboard? 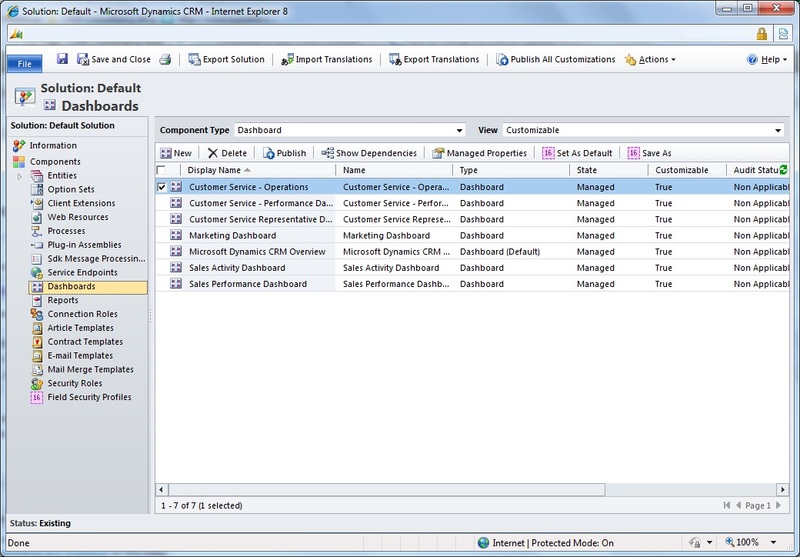 You can do this via SharePoint Dashboards, but not via the default CRM 2011 Dashboard functionality. However you do always have the option of double-clicking on the Account to open up the Account, and the expanding the Charts section on the right-hand side – this will show you a Chart filtered for just the opened Account as opposed to a specific View of Accounts. Thanks for your reply. Ultimately what i imagined was a scenario where a person sees on his dashboard a bunch of records he has to say approve\reject. In most of the cases he may just do a select all on the list and do a bulk apporve using a button on the ribbon. In case he wants to see more details for the records he could select the record in the list and this event would trigger a display of the detail adjacent ot the list similar to the outlook experience of selecting a mail item will display the content in the reading pane. Can you create dashboards that connect to external databases? 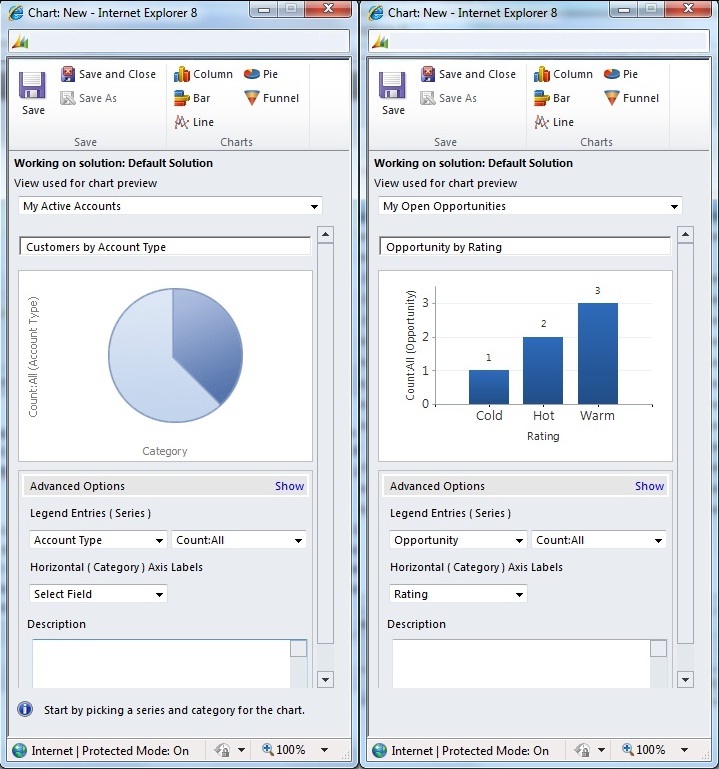 Hi Michael, not using the standard CRM Charts – however you could create SQL Reporting Services Reports that look at other External Databases alongside CRM, upload these reports into CRM so they appear within the CRM Reports area, and then present these within standard CRM Dashboards using an iFrame. So it can be done – but involves custom Report Writing to develop the Report using SQL, once that is done, the reports can be incorporated into CRM Dashboards. Just the answer I was looking for! Thank you. 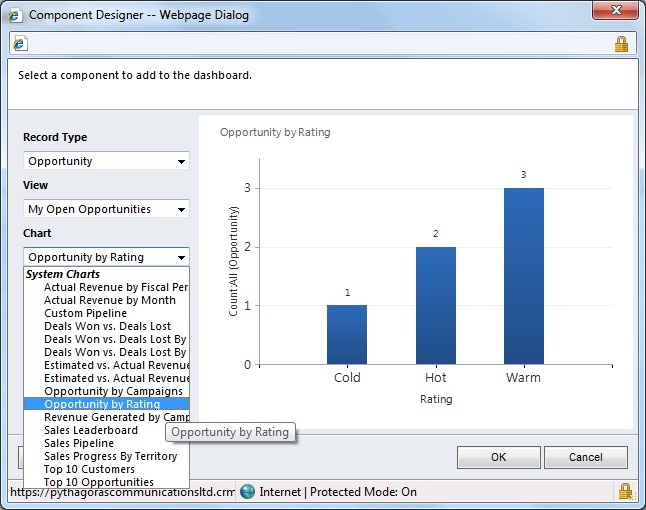 In your example Dashboard you show four charts and 2 data lists (views). Is it possible to associate / relate these data lists and charts. I think I understand from the above posts the answer is no and this is only possible in SharePoint or SSRS. ideally you want to add a view and a few charts based on the same view. Then you want ot be able to select records in the list or set a filter and have this apply to the associated charts. Is it possible to achieve this in any way? Can it be achieved by modifying the XML in visual studio. Essentially no – this would require a more interactive Dashboard than the native CRM 2011 functionality, as the CRM 2011 Dashboard areas (Charts) are independent of each other and do not support a Universal Filter or Input Parameters that would work across the Dashboard in this way. (1) Say add a CRM Web Part to show a list of Cases onto a SharePoint Dashboard Page. (2) Add another CRM Web Part to show a list of Opportunities. (3) Add a 3rd and final CRM Web Part to show a list of Accounts. (4) Connect the 3rd Web Part to act as the input connector for the 1st and 2nd Web Parts – this will have the effect of filtering the list of Cases and Opportunities shown to only show the Cases and Opportunities for the Account selected in the 3rd Web Part, giving a very basic Dashboard approach. (5) This is fairly simple but when combined with SharePoint Filter Web Parts and then potentially SSRS Reports can give a more complex dynamic dashboard. So you can build a certain level of dynamic dashboard without SSRS, but SSRS gives the presentable element really for a graphical dashboard that is not a simple set of lists. As with many of the SharePoint/CRM combinations, you can achieve powerfully results with the high level of flexibility found in the two platforms but is a development effort to understand and develop the platforms to achieve these results.